My winter steed. 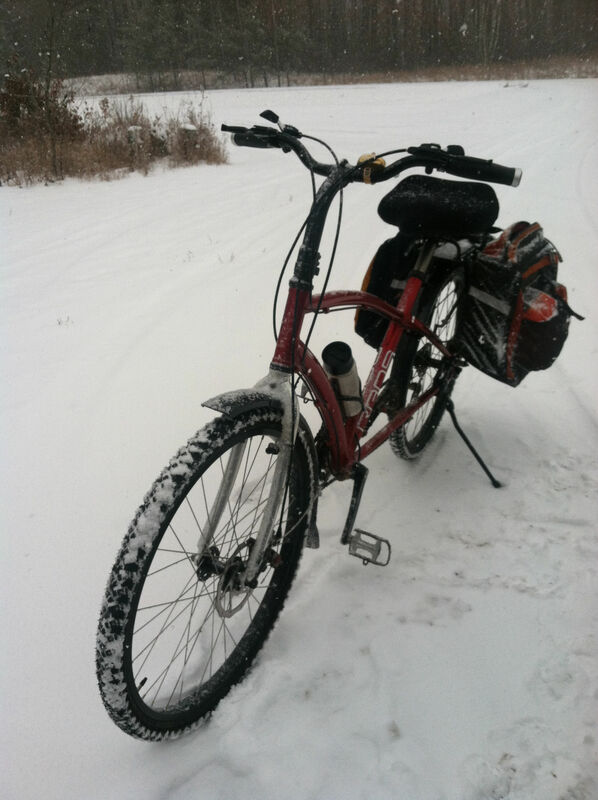 Heavy, lots of rolling resistance on those studded tires! 2011 was a great year for biking, not so good for blogging! I’ll try to catch up during the winter which finally arrived today. I parked at the C Store in Cass Lake this morning and biked the 6 miles to the hospital for rounds. By the time I was done it had started to snow and the shoulders were greasy with a half inch of fresh, heavy snow on top of the usual shoulder grunge. The trip back to the car felt like 20 miles and took me over an hour in embarassingly low gears. No problems with getting cold. The new winter bike was rock solid stable with great traction and as always it feels great to get where you are going on your own power. Biggest probem (other than a worn out engine) was I couldn’t get going fast enough to allow my glasses to defog! Looking forward to the 3d Annual Brrrrmidji New Years Bike Ride tomorrow, 1PM at the Cabin Coffeehouse. See you there!! 1 Response to Last Bike Ride of the Year! Image 48 is a nice one! I have it on my computer as the screen saver. It’s an inspiration to get out biking in the snow.